I’d like to share an experience with you and use it as an example of how to analyse an experience. I have divided the story into headings because that’s the easiest way to examine events that cause you stress. What is this dog thinking!! Actually I’ve only just noticed (many months of writing this article) that the dog walking on the road is actually on a lead being held by someone in the car. 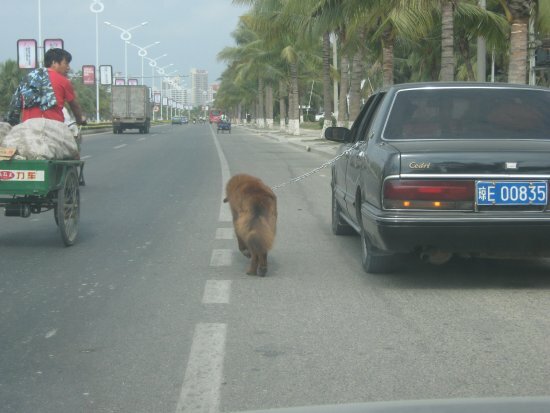 Instead of asking what is this dog thinking?, I should have asked, what are the dog’s owners thinking! EVENT: This is a true story! Driving home along the freeway recently I was horrified to see a woman (not a dog as in the picture) walking determinedly on the solid white line in the middle of the road. MY IMMEDIATE THOUGHTS: ‘What on earth are you thinking!! !’ ‘Have you got a death wish?’. Her thoughts and my thoughts about walking in the middle of the road were obviously very different! A very important point to remember is that ALL our behavior is motivated by a belief. Our beliefs about road safety were seriously different! MY BELIEFS: ‘Walking in the middle of the freeway is extremely dangerous as the likelihood of being run over is very high.’ You could say it’s just plain stupid, but that’s insufficient. You need to say why it’s stupid. HER BELIEFS: I can only assume that she believed walking on the solid line was safe because (legally) motorists are not allowed to cross the white line. Well that’s true, but not all motorists are law-abiding! She definitely had some faulty thinking patterns. Take a look through the list of Faulty Thinking Patterns. Can you see which ones you commonly fall into? Make a note of these. For example:Please print out this list of Faulty Thinking Patterns as, in my mind, this list holds the key to overcoming depression. Print out several copies and stick them up all over your home, so you can easily learn them. Also make a copy to stick in your notebook. You will be constantly referring to the list. Could you do this now before we continue. Jumping to Conclusions (no 6b) is the common Faulty Thinking Pattern of a person with high anxiety levels and is usually future related. For example a thought like ‘There’s no point in going for that job interview because I know I won’t get it’ fits into the category of Jumping to Conclusions. Ask yourself if you really have the ability to foretell the future! ‘Should’ statements (no.1) is a common Faulty Thinking Pattern of a perfectionist. A perfectionist wants everyone and everything to be perfect, so a conversation is often full of comments like ‘I should have … He should have … ‘. Living in an imperfect world it’s no surprise that a perfectionist is very prone to depression – they’re always disappointed. I find the word ‘should’ to be the ‘big badie’ and that’s why I’ve put it at the top of the list. I can’t tell you how many marriages I’ve counselled where the word ‘should’ is the guilty party. The words ‘should, must and ought‘ are the source of all anger, guilt and resentment as they are very controlling words. Most people don’t like to feel controlled! Listen out for these words in your own speech as well as in others and become aware of the emotional reaction it causes. Is there someone in your life who you think ‘should‘ be different to what they are? Maybe several people? Easier said than done, I know, because to do this you have to give up the word ‘should’. You’ll also have to give up the urge to change the other person and rather accept them as they are. “Impossible!” you might exclaim, especially if that person has abused you. A person’s behavior is usually a result of their own past and is often understandable if you look at the bigger picture. Doing this can help lessen your emotional reaction a bit. Can you do that? It DOES NOT excuse the behavior but it can give some understanding. If a person is constantly hurting you, you do need to set up boundaries and not ‘catch’ every remark that they say. Click here to have a look at many more examples of the faulty thinking patterns. You might want to just look at a few at a time and gradually work your way through them during the week. It’s very important to understand what is meant by each of the faulty thoughts. During the week, try to analyse some situations that you experience in this way. Note how differently people react to the same situation. Write it down and try to work out what the different people must be thinking (their belief) to react the way they do. Click here for the list of Faulty thinking patterns as well as the Mood Analysis form that I follow here. I highly recommend that you print this out for future reference.